Old Fire is the project of Texas based musician and programmer John Mark Lapham, once of The Earlies and 4AD band The Late Cord. Admittedly, neither name mean anything to me so I approach this album with no preconceptions. I do have a rather large glass of Jack Daniels to hand, I confess, which may or may not aid my misfiring synapses. Originally conceived as a 4AD project for The Late Cord, a parting of ways with that group’s co-founder, Micah P. Hinson led Lapham to continue and eventually conclude this ten year journey on his own, but with the assistance of many musical friends, some met, some via the internet. An introduction to Pearls Before Swine singer songwriter Tom Rapp by 4AD mainman Ivo Watts-Russell led to Rapp contributing his cracked and yearning vocals to the song Shadows, and the project was underway. After Tom Rapp’s timely introduction, the project took shape, kick-starting the idea to feature different singers and musicians recording both cover versions and originals. A disparate collection of 22 guest musicians and singers, all of whom are featured on the Old Fire website, contribute to a collection of songs, most of which are dedications to people, some living, some no longer with us. The album comprises original compositions and esoteric cover versions of songs by Psychic TV, Low, Shearwater and others. Flitting between his hometown of Abilene, Texas, New York, and London, Lapham found himself continually drawn back to the South of the USA where a job in real estate provided inspiration brought on by discarded photographs and sundry abandoned family objects in properties across the region. In addition, remarking on the slow evolution of the project Mark says “Ten years is a long time. Children become adults, boomtowns go bust, and relationships come and go”. This transposed air of melancholy, wistful nostalgia, and ghostly reflection is apparent throughout the album, and coincidentally or not Songs From The Haunted South has a similar atmosphere to the classic 4AD collaborative This Mortal Coil albums. However, Songs… puts all this through a hazy Americana-inspired ambient filter, laced with much subtle psychedelia, and the occasional skewed pop melody. I have had this album for a few months, and it has taken a while to seep in. At first it floated over me virtually unnoticed, but after repeated plays I can now fully appreciate its intricate delicacies and surreal American Gothic vistas. Much more can be gleaned from the Soundcloud link below, which contains the album and John’s commentary on each track. 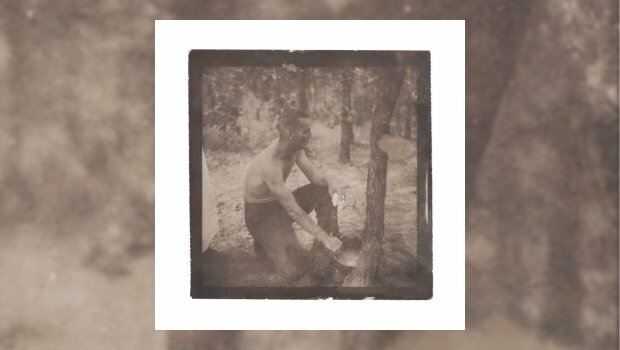 Although this album ended up on kscope in the UK it has that familiar 4AD otherworldy feel brought up to date, and the evocative cover art is supplied by 4AD design guru Vaughan Oliver, and features a sepia-treated photograph from 1958 of Lapham’s father on bivouac training in the Ozark Mountains. Curiously kscope seems a natural home as Songs From The Haunted South fit the label’s self-proclaimed “post progressive sounds” remit perfectly, kscope being a natural 21st century successor to 4AD’s filtered strangeitude. Much like a favourite shirt, this album might not make much of an initial impression, but once lived in a while it becomes comfortable and a part of you. Songs From The Haunted South is genuinely beguiling, and I recommend it highly. Far too many to mention – see the website link below, or buy the CD!